This article is about the mythical creature of Korean folklore. For other uses, see Dokkaebi (disambiguation). The earliest known documentation of dokkaebi is in the Silla-era tale of "Lady Dohwa and Bachelor Bihyeong" from the Memorabilia of the Three Kingdoms compiled during the Goryeo period. Dokkaebi are featured in many folk tale anthologies compiled during the Joseon period. Dokkaebi are different from ghosts, called gwisin (귀신) in Korean, in that they are not formed by the death of a human being, but rather by the spiritual possession of an inanimate object such as old discarded household tools like brooms, or objects stained with human blood. The physical appearance of the dokkaebi is presented in many different ways and has varied by different time periods, but they have always been depicted as fearsome and awe-inspiring. The most common depiction of them is based on ancient roof tiles with dokkaebi patterns. Different versions of the dokkaebi mythology assign different attributes to them. In some cases, they are considered harmless but nevertheless mischievous, usually playing pranks on people or challenging wayward travelers to a ssireum (Korean wrestling) match for the right to pass. Dokkaebi are extremely skilled at wrestling and cannot be beaten unless their right side is exploited. In other tales, dokkaebi only have one leg, so one should hook their leg and push them to win. Dokkaebi fire is a glimmering light or tall blue flames that herald the appearance of dokkaebi. Dokkaebi possess magical items, such as the dokkaebi hat called the dokkaebi gamtu (도깨비 감투), which grants the wearer the ability of invisibility, and the dokkaebi magic club called the dokkaebi bangmangi (도깨비 방망이), which can summon things and act functionally as a magic wand. Dokkaebi have immense supernatural powers, can bring good harvests, big catches and great fortunes to humans, and are defenders against evil spirits. Rituals are held to appeal to dokkaebi to bring benefit to humans. Some communities hold rituals to chase away dokkaebi, who are thought to be the causes of fires and contagious diseases. Most Korean legends have Dokkaebi in the stories. They are about Dokkaebi playing pranks on mortals or punishing them because of their evil deeds. One of them is about an old man who lived alone in a mountain when a Dokkaebi visited his house. With surprise, the kind old man gave the Dokkaebi an alcoholic beverage and they become friends. The Dokkaebi visited the old man often and they had long conversations together, but one day, the man took a walk by himself in the woods near the river and discovered that his reflection looked like the Dokkaebi. With fear, he realized that he was gradually becoming that creature. The man made a plan to prevent himself from becoming a Dokkaebi and invited the creature to his house. He asked, "What are you most afraid of?" and the Dokkaebi answered, "I'm afraid of blood. What are you afraid of?" The man pretended to be frightened and said, "I'm afraid of money. That's why I live in the mountains by myself." The next day, the old man killed a cow and poured its blood all over his house. The Dokkaebi, with shock and great anger, ran away and said, "I'll be back with your greatest fear!" The next day, the Dokkaebi brought bags of money and threw it to the old man. After that, Dokkaebi never came back and the old man became the richest person in the town. Cham dokkaebi (Korean: 참도깨비; literally really dokkaebi): A mischievous dokkaebi. Contrast with gae dokkaebi. Gae dokkaebi (Korean: 개도깨비; literally wild dokkaebi): Evil dokkaebi. Contrast with Cham Dokkaebi. Gim Seobang dokkaebi (Korean: 김서방 도깨비; literally Mr. Kim Dokkaebi): A dumb dokkaebi that looks like a farmer. Nat dokkaebi (Korean: 낮도깨비; literally day dokkaebi): Unlike other dokkaebi, these appear during the daylight. They are known to give dokkaebi gamtus to humans. Go dokkaebi (Korean: 고도깨비; literally high dokkaebi): Dokkaebi known to be good at fighting and handling weapons, especially arrows. Gaksi dokkaebi (Korean: 각시도깨비; literally maiden dokkaebi) and chonggak dokkaebi (Korean: 총각도깨비; literally Bachelor Dokkaebi): Dokkaebi, known to attract humans. Oenun dokkaebi (Korean: 외눈도깨비; literally one-eyed dokkaebi): A one-eyed dokkaebi that eats a lot. Oedari dokkaebi (Korean: 외다리도깨비; literally one-legged dokkaebi): A one-legged dokkaebi that likes to play Ssireum. 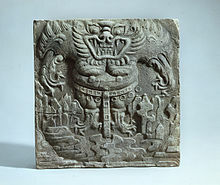 ^ "Earthenware Patterned Tiles from Oe-ri, Buyeo (Tile with Demon Design)". National Museum of Korea. Retrieved 5 February 2017. ^ Lee, Jonathan H. X. (2011). Encyclopedia of Asian American Folklore and Folklife. ABC-CLIO. p. 664. ISBN 9780313350665. Retrieved 12 January 2019. ^ Klepeis, Alicia Z. (2015). Goblins. Cavendish Square Publishing, LLC. p. 48. ISBN 9781502609359. Retrieved 12 January 2019. ^ a b c d The National Folk Museum of Korea (South Korea). Encyclopedia of Korean Folk Beliefs: Encyclopedia of Korean Folklore and Traditional Culture Vol. II. 길잡이미디어. pp. 154–155. ISBN 9788928900572. Retrieved 5 February 2017. ^ The National Folk Museum of Korea (South Korea). Encyclopedia of Korean Folk Literature: Encyclopedia of Korean Folklore and Traditional Culture Vol. III. 길잡이미디어. p. 356. ISBN 9788928900848. Retrieved 5 February 2017. ^ "부여 외리 문양전 일괄 (扶餘 外里 文樣塼 一括)". Cultural Heritage Administration (in Korean). Retrieved 5 February 2017. ^ a b The National Folk Museum of Korea (South Korea). Encyclopedia of Korean Folk Literature: Encyclopedia of Korean Folklore and Traditional Culture Vol. III. 길잡이미디어. pp. 297–299. ISBN 9788928900848. Retrieved 5 February 2017. ^ The National Folk Museum of Korea (South Korea). Encyclopedia of Korean Folk Beliefs: Encyclopedia of Korean Folklore and Traditional Culture Vol. II. 길잡이미디어. pp. 51–52. ISBN 9788928900572. Retrieved 5 February 2017. This page was last edited on 10 April 2019, at 02:23 (UTC).